Click on it and boom! Let me know if you find any bugs! 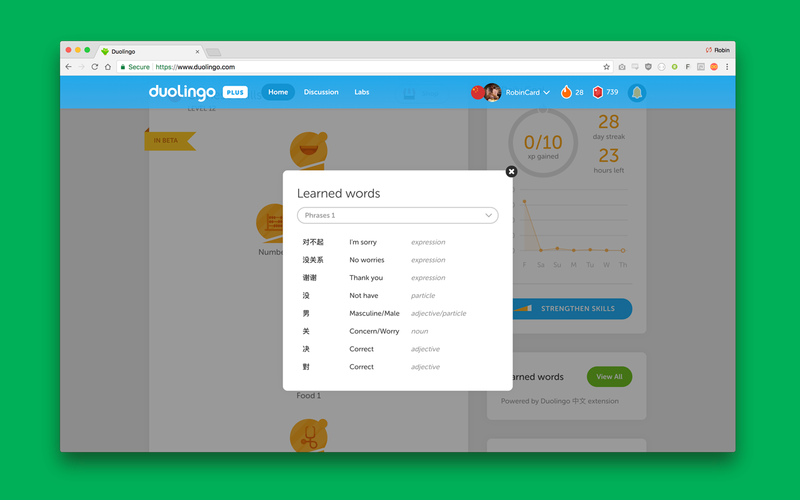 Hi, I don't see the button "Learned words" yet, although I reinstalled the plugin. The version is 0.9992. That's weird it should be on the home page under all the XP stuff have you tried going onto the homepage and hard refreshing the page? My mistake, saw the button now on the right-hand side. It's working, too :-) Sorry and thanks. The flag change makes sense, since traditional characters are rarely used in China but much more often outside of China. Very much appreciated! Although I did not select traditional characters it is now using traditional characters at least when I do strengthen exercises. How do I get back to simplified? Thank you so much for pointing out that the bug in the practice section. That shouldn't have got through regression testing. You seem to have misunderstood. It is displaying traditional and I want simplified. That is all done now. You'll have to wait until Google publishes 0.9994, we go through a process where google checks our code to make sure there's nothing naughty in it! ohhh my bad. sorry. Give me 10 minutes. This might be an odd request but can you make some sort of way where one can see all the words you've learned at once? Maybe in alphabetical order or something so it could be utilized for looking up words that one might have forgotten? Also: Thanks for creating those packs, they really help out a lot! Sure, that sounds reasonable. Remember that alphabetical order in Chinese means number of strokes, so you'll get the easiest ones first. 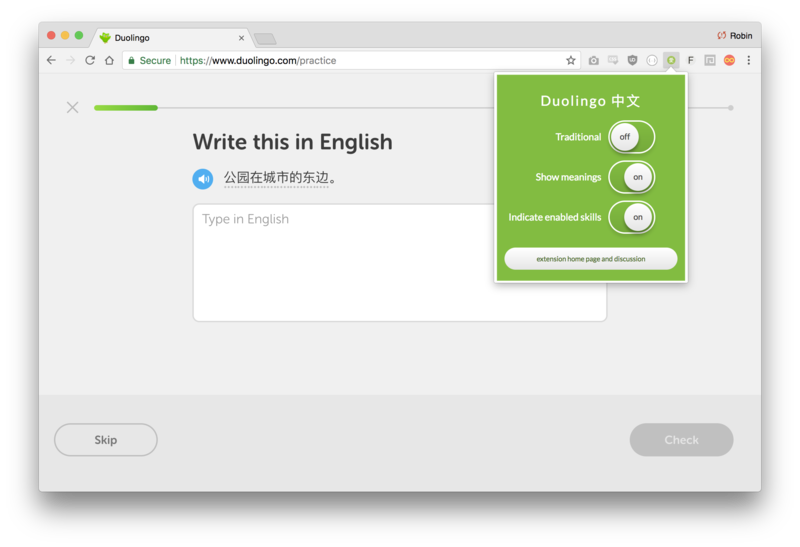 Someone else asked to be able to sort by Chinese and English so I will include both. I'll drop you a reply when it's done. This feature is now up-and-running. You may need to wait 30 minutes for Google to upload it. I downloaded the extention (version 0.999) a few minutes earlier and I used it for a while (I added a few characters to the word bank) but there is no "Learned words" button on the home page. Right under the xp are my achievements as usual. I refreshed the homepage a few times but stil nothing. Could you please help? 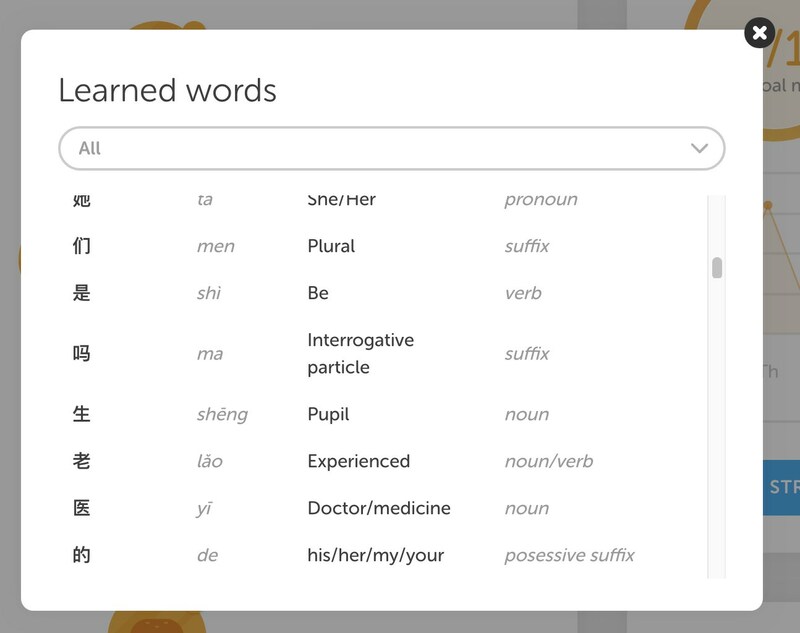 Not only there is no button for "learned words" on the homepage but it also gives the wrong explanations for the characters. It said "期" meant "meet" and "现" meant "year" which are obviously wrong. I think I will uninstal the app since it is not working as it should and it slows down my browser. But thank you for the effort.